Designed specifically for trucks and large vehicles, the TomTom GO 7000 TRUCK brings the latest navigation innovations so you can drive your business forward. Including TomTom Map Share technology, the TomTom GO 7000 TRUCK allows drivers to make instant updates to their maps and to share these updates with the online TomTom community. The TomTom GO 7000 TRUCK also features new Map Share functionality, which allow truck drivers to make corrections to their map by adding or changing access restrictions for roads based on dimension and weight. TomTom GO 7000 Truck has been discontinued. TomTom GO 7000 TRUCK uses smarter navigation to plan better routes for your drivers. They are less likely to get stuck, delayed or drive unnecessary distances - meaning efficient journeys and accurate scheduling. Dimensional and weight restrictions* are currently available on major and interconnecting roads in Austria, Belgium, France, Germany, Luxemburg, the Netherlands, Spain, Switzerland and Great Britain. The TomTom GO 7000 TRUCK features TomTom's unique IQ Routes technology for efficient route calculation. Based on historical travel time information for every road, rather than the traditional staic measure of maximum speed per road type, the TomTom GO 7000 TRUCK provides a more accurate measure of journey time. By calculating routes based in this manner, the TomTom GO 7000 TRUCK can select the optimal route, saving significant time and lowering fuel costs. TomTom’s unique Map Share technology enhances your navigation experience, because you can now make instant changes directly on your map. You can also benefit from the thousands of corrections made by TomTom users every day with access to the most recent user changes from the TomTom Map Share database. Plus, with new TomTom TRUCK Map Share functionality, truck drivers can also make corrections to their map by adding or changing access restrictions for roads based on dimension and weight. TomTom GO 7000 TRUCK is ideal for professional drivers operating in a commercial vehicle feet. Used in combination with LINK 300 and a subscription to TomTom WEBFLEET®, the driver can easily report on business mileage and receive destination addresses and orders on their device. HD Traffic™ and other LIVE Services* ensure drivers receive current real-time traffic information, as well as reports about delays and suggestions on alternative route suggestions. HD Traffic coupled with TomTom IQ Routes™ ensures the best route and provides the most accurate arrival times. With LIVE Services, drivers also get other relevant route information, including Safety Alerts - so they know what’s ahead, Local Search with Google - so they can find service stations and businesses on their route and Fuel Prices - so they can find the cheapest fuel around. 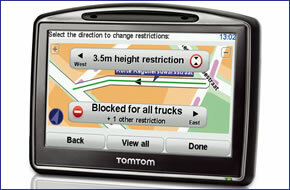 TomTom GO 7000 TRUCK mounts on the inside of your vehicles windscreen using the suction cup windscreen bracket provided. TomTom GO 7000 TRUCK can be powered directly either from its internal battery if it's fully charged or powered from the cigarette lighter socket.